Ringheim, K. and Feldman-Jacobs, C. (2009). Engaging Men for Gender Equality and Improved Reproductive Health. Population Reference Bureau: Washington, DC. 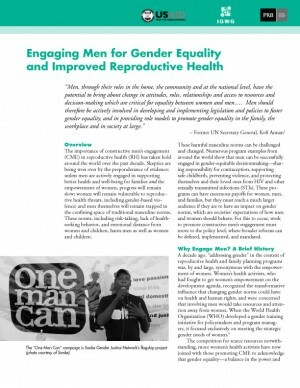 The importance of constructive men’s engagement (CME) in reproductive health (RH) has taken hold around the world over the past decade. Skeptics are being won over by the preponderance of evidence: unless men are actively engaged in supporting better health and well-being for families and the empowerment of women, progress will remain slow; women will remain vulnerable to reproductive health threats, including gender-based violence; and men themselves will remain trapped in the confining space of traditional masculine norms. These norms, including risk-taking, lack of healthseeking behavior, and emotional distance from women and children, harm men as well as women and children. These harmful masculine norms can be challenged and changed. Numerous program examples from around the world show that men can be successfully engaged in gender-equitable decision-making – sharing responsibility for contraception, supporting safe childbirth, preventing violence, and protecting themselves and their loved ones from HIV and other sexually transmitted infections (STIs). These programs can have enormous payoffs for women, men, and families, but they must reach a much larger audience if they are to have an impact on gender norms, which are societies’ expectations of how men and women should behave. For this to occur, work to promote constructive men’s engagement must move to the policy level, where broader reforms can be defined, implemented, and mandated.